Apple has officially releases its latest iOS 7.0.5 Firmware (Build: 11B601) for iPhone 5S and iPhone 5C smartphones only, the newest firmware update is only available for selected iPhone devices sold in China, Europe, Asia Pacific and outside U.S. The Direct Download Links of iOS 7.0.5 IPSW Firmware for iPhone 5S and iPhone 5C is available below. The latest Apple iOS 7.0.5 Firmware (Build: 11B601) update contains fixes to correct network provisioning for iPhone 5S and iPhone 5C models compatible with China's networks and also fixes for bugs. Currently, Apple iOS 7.0.5 Firmware is not available nor compatible with iPhone 5, iPhone 4S, iPhone 4, iPod Touch 5G, iPad Air 5G, iPad 4G, iPad Mini, iPad Mini 2, iPad 3G and iPad 2G devices. Apple iDevice users might get iOS 7.0.6 or iOS 7.0.7 firmware updates in future before the final released of iOS 7.1 Firmware, which is currently under beta testing process. 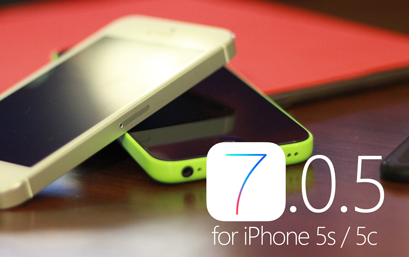 How to Download and Install iOS 7.0.5 Firmware on iPhone 5S and iPhone 5C? Apple iOS 7.0.5 Firmware is officially available via OTA process (Over-the-Air) for iPhone 5S and iPhone 5C smartphone users, by heading over to Settings > General > Software Update. Apple iDevice users can also Download iOS 7.0.5 IPSW Firmware for iPhone 5S and iPhone 5C via Direct Links and can install it manually by plugging device via iTunes. How to Jailbreak iOS 7.0.5 Firmware Using Evasi0n7 Tool? Recently, A very well-known and popular iOS-developer named "T0ma_94" and "i0n1c" has posted a screenshot of Untethered Jailbreak iOS 7.0.5 Firmware on iPhone 5S having Cydia v1.1.9 Installed with modified version of evad3rs Evasi0n7 Jailbreak Tool, check out screenshot image below. Update: Team evad3rs has now officially releases the newest version of Evasi0n7 to jailbreak iOS 7.0.5 firmware. Apple iPhone 5S and iPhone 5C users can officially Untethered Jailbreak iOS 7.0.5 Firmware On iPhone 5S and iPhone 5C using Evasi0n7 Tool available via direct links below.